The rooms were so comfy. Aircon was so cool. Big size bed. 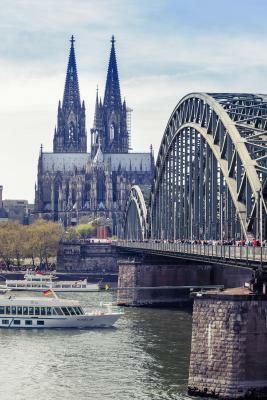 If you are going to Köelnmesse or Lanxess arena it is great location, otherwise you have much better deals in the city. Last year I have been in ibis hotel and this type of rooms is ok for me. Tha staff is great. You can check in even if you come after midnight. 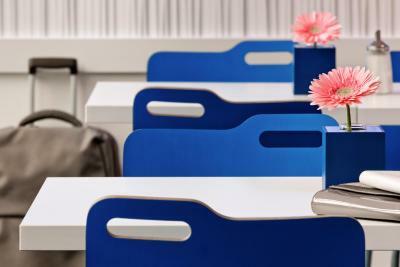 There is a room where you can leave your baggage if you have late flight. 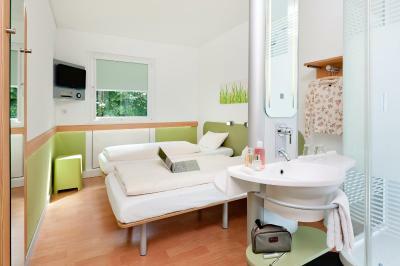 For me and my sister everything was ok.
Good value for money, clean room, friendly staff. Good location. If for short escape and save money, you can choose to stay here but if for leisure then find another hotel. it is a simple and basic good and clean hotel, and when you pay for Budget hotel - you can not complain. the room has a good heating, hot water, bed is comfortable and breakfast is basic and nice. 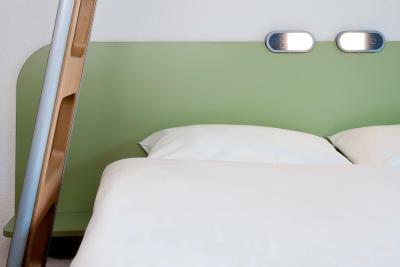 the hotel is efficient, simple and suits a Low-Budget Traveller. Staff was perfect, the lady at the reception while our check-in was really helpful and knowledgeable. Clean and nice at the property. 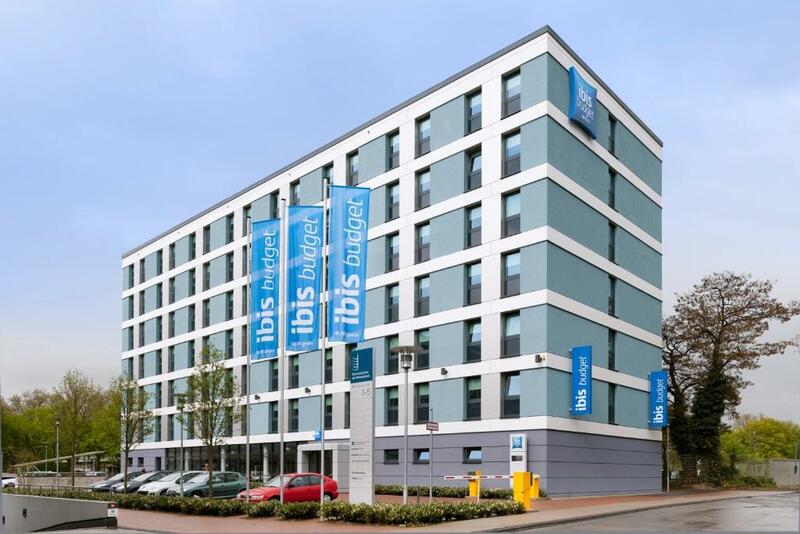 Ibis budget Koeln Messe This rating is a reflection of how the property compares to the industry standard when it comes to price, facilities and services available. It's based on a self-evaluation by the property. Use this rating to help choose your stay! 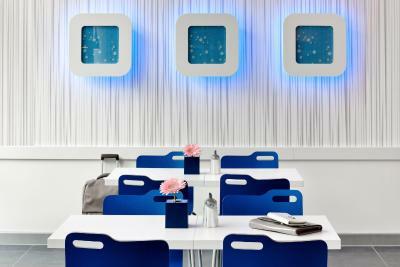 Ibis Budget Koeln Messe offers free WiFi. 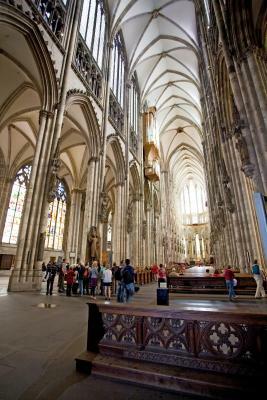 It is 2,300 feet from the Lanxess Arena, 2,650 feet from the Messe/Deutz Train Station and 2,950 feet from the KölnMesse exhibition grounds. 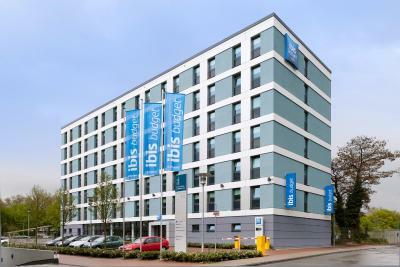 Each room at Ibis Budget Koeln Messe is air-conditioned and includes a flat-screen satellite TV, a desk, a shower and WC. 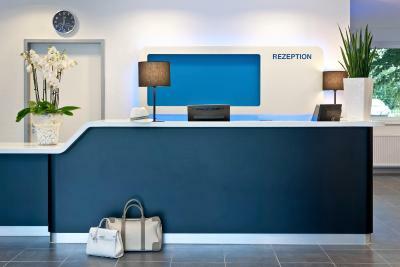 At Ibis Budget Koeln Messe you will find a 24-hour front desk. There is also a mini market. Dusseldorf International Airport is 25 mi away. 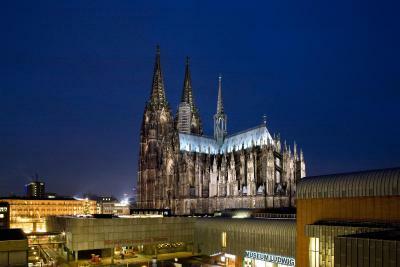 When would you like to stay at Ibis budget Koeln Messe? 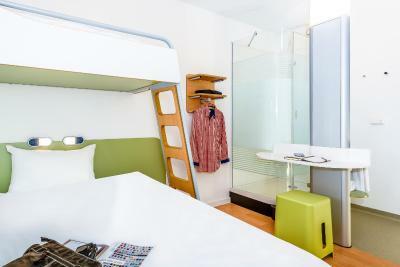 Air-conditioned room with free WiFi, a flat-screen satellite TV, a shower and WC. 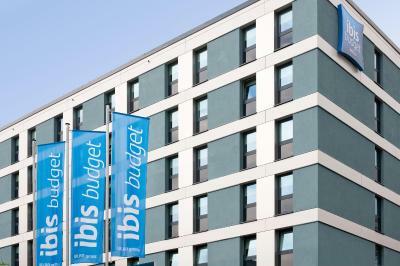 House Rules Ibis budget Koeln Messe takes special requests – add in the next step! 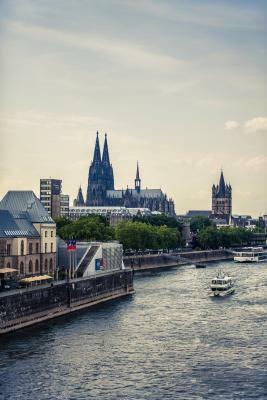 Ibis budget Koeln Messe accepts these cards and reserves the right to temporarily hold an amount prior to arrival. Glass shower. Not good for dou le accupancy. Nice room for single occupancy. Beds were too firm for my liking and only one pillow per person. Decent breakfast and good value. Bad WiFi. Low insulated rooms. AC was not working but the weather was fine so it was not a big problem. It was a nice Budget Hotel, nice breakfast. Enjoyed our stay. 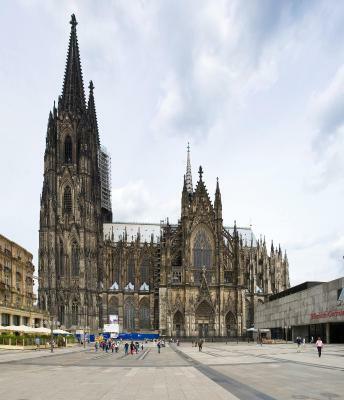 Walking distance to Cologne Cathedral. Parking on the premises was nice. 1. One of the front desk officer is very nice and kindly lady. 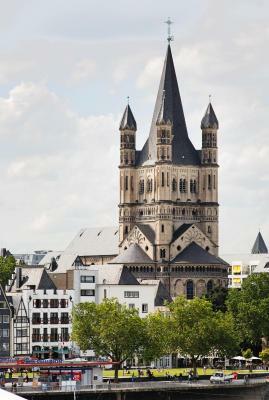 She helps us with many information about Koeln. She even volunterily took our photo in from of the hotel. She treats us like her own family.... yet, all of the staffs are kind and helpful. 2. The view is not that bad. 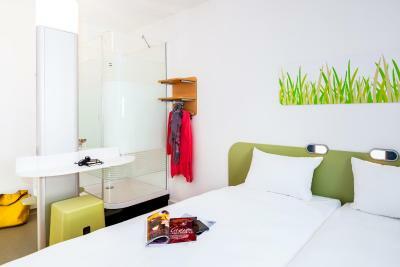 But is not that good compare to what you'll see at Ibis budget Zurich city west. Is not neccesarry to write nothing bad,is ibis budget,but annoying that i get separate bads in one room being with my gf. Confortable,clean,good for one night stay. There's nothing anywhere close to the hotel - no food, no life. On the reception you can only get some drinks and snacks from the minimarket. Breakfast is ok but only barely so. On the second day there was a considerable queue for the breakfast. Best price in city. Not far from the center, tram stop nearby and the parking is available as well (8 eur/day). Modern building and nice room design. OK breakfast.